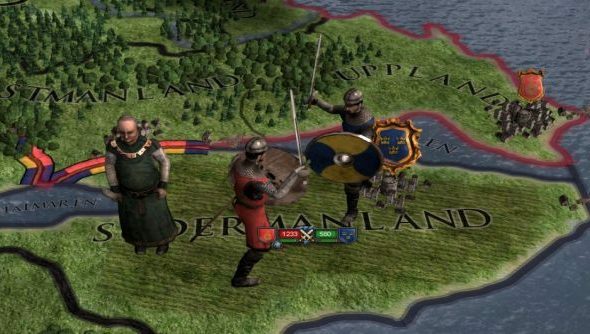 If you had any plans this weekend, you can forget them: Paradox’s feudal strategy game, Crusader Kings II is free to play this weekend on Steam. I’m sure you’ve heard about the mad stories that come from this game – it oozes with anecdotal potential. If you’re still on the fence about Crusader Kings II, you should probably try it. The free to play weekend is in celebration of selling over a million copies of the game; Paradox are still in shock at the games success. Now Crusader Kings II is notorious for being a bit intimidating for newcomers, but don’t let that put you off. Youtuber Arumba has a detailed video tutorial that will get you up to speed in no time. It’s a lengthy series, but you only need to learn the first few basics to get the ball rolling. If on the other hand you’d rather see a playthrough of the game which is both mind blowing, tense and funny all at the same time, may I direct you to that of Idle Thumbs. Don’t forget to check the official Steam page for Crusader Kings II on Friday.